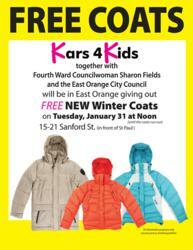 Kars4Kids car donation charity and East Orange Councilwoman Sharon Fields team up to combat winter with a free coat distribution. After the incredible success of their coat distribution in Newark NJ with Mayor Cory Booker, Kars4Kids, the car donation charity, has expanded the program to East Orange New Jersey. Kars4Kids will be teaming up with Fourth Ward Councilwoman Sharon Fields for the distribution which will be held on Tuesday January 31st. There will be coats available for both adults and children in a variety of sizes. Kars4Kids recently held a coat giveaway in Newark New Jersey with Mayor Cory Booker, distributing close to 1,000 children's coats. "Even as it gets later in the season, sadly, many still do not have proper outerwear to protect themselves in the winter weather," said a Kars4Kids spokesman, "we've been lucky to have a very mild winter to this point, however, any winter is too cold to face without a coat." Kars4Kids also says that the distribution in Newark reinforced to them the necessity of these events, “At the Newark event we witnessed the tremendous need in today's economy and we knew we had to do this again. We were also very happy with the event in Newark, the participants were polite and good-natured, and the event was so orderly and incredible in every way. Many people were coming over to thank us, we saw real expressions of gratitude.” See here for pictures from the Kars4Kids coat giveaway in Newark. The distribution will be held at 15-21 Sanford st. (in front of St. Paul) on Tuesday January 31st at Noon and will continue until all the coats have been distributed. Large crowds are expected and police will be on hand to direct traffic. For more information please see the Kars4Kids coat giveaway page.